If you are one of the many who suffer from eczema or seborrheic dermatitis, you know all about the pain, inflammation, and unsightly rashes of dry, cracked skin that can develop on your hands, feet, face, scalp, elbows, and knees. There are numerous synthetic and natural remedies that have been recommended for decades, by they don’t they always work as advertised, and you end up with messy, uncomfortable, and right back where you started. Fortunately for those of you with eczema or SD, many studies are showing scientific evidence for the use of coconut oil to treat your chronic skin condition and soothe your symptoms. Let’s take a look at the causes of eczema and SD, and how coconut oil works to treat the condition, and other chronic skin conditions like seborrheic dermatitis. Coconut oil has antibacterial, antioxidant, anti-fungal, and antimicrobial properties that soothe your skin. During a flare-up, coconut oil can also reduce skin inflammation (source). It works because it contains lauric acid, a lipid (fat) found in breast milk, and oddly, in coconut oil. The specific causes of eczema can be multifold: genetic factors, allergies to metal exposure such as nickel or any other irritating substance. People with eczema typically have a bacteria in their skin called staphylococcus aureus that can be treated with a topical antibiotic, but also becomes resistant to antibiotics over time. 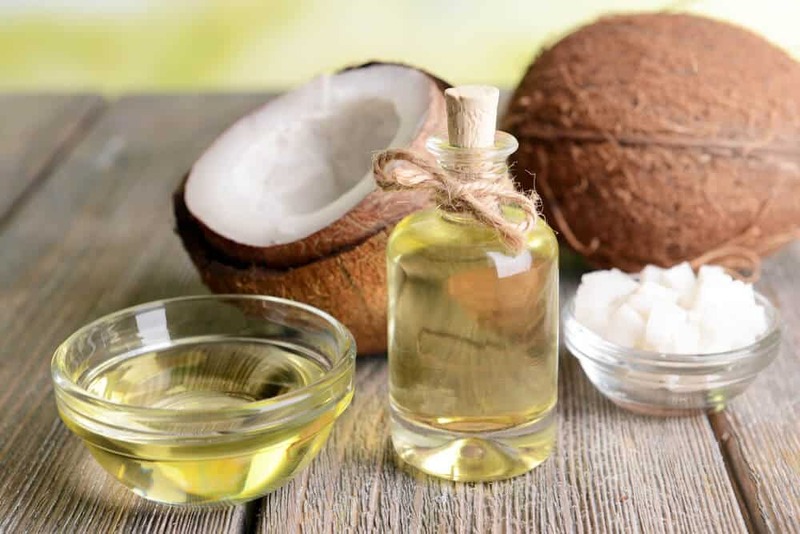 Due to the long term resistance of the bacteria, natural remedies such as coconut oil are highly favored because the body does not start to resist treatment over time. Using coconut oil also helps keep skin well-moisturized and youthful, which are both delightful added benefits of using a natural remedy as opposed to a harsher synthetic one. When it comes to seborrheic dermatitis, there is no specific known cause. The apparent causes are attributed primarily to stress, genetics, yeast infections of the skin, certain medical conditions and medications, or just plain cold and dry weather. Scientists and physicians have determined that most symptoms are caused by the secretions of a yeast bacteria that lives on the skin known as malassezia, which cause the inflammation and flaky skin common to the condition. In infants, SD is typically referred to as “cradle cap”, and typically goes away by the time an infant reaches a year old. Treatments with coconut oil are most effective due its containing caprylic acid, a fatty acid that directly combats and digests the yeast malassezia topically and internally. There are numerous ways that coconut oil fights eczema and seborrheic dermatitis, but here’s the basic run down. Normal skin produces enzymes called lipases, which are digested by the body and in turn converted into fatty acids that keep your skin from absorbing bacteria such as those found in persons suffering from eczema and SD. Virgin and extra virgin coconut oil destroy bacteria on the surface of the skin by converting them to fatty acids topically. This also creates an acidic skin environment that is hostile to bacteria and yeasts, and prevents further bacterial contamination. There are all kinds of ways to use coconut oil to treat chronic skin conditions with the antimicrobial and antifungal properties it offers. A combination of both internal and external use should be considered for maximum effectiveness. Two to five tablespoons a day is the recommended amount for internal use when treating eczema and other skin conditions. Not only will it fight the bacteria formation on your skin, but it also boosts your overall immune system against other ailments and infections. Getting your daily dose of coconut oil is simple and delicious: you can use it as your primary cooking oil when preparing food, add it to your favorite hot or cold beverage like cream, or even eat it straight with honey or in hot/cold cereal. As for external application, the severity of your symptoms will largely determine how often you will need to apply coconut oil to your skin. For those with mild eczema symptoms, you may only need to treat affected areas of the skin once or twice a day, whereas those with more severe eczema will want to apply coconut oil multiple times per day. The most important point to keep in mind is that coconut oil is most effective in treating eczema when both internal and external use are the primary means of application. This will aggressively combat your condition both at the source internally, and where symptoms present on the surface of your skin, making it by far one of the most effective natural treatments. The most effective method for using coconut oil to treat eczema and seborrheic dermatitis is an oil cleanse. It is said this method was originally developed by the Romans, and though they likely used a variety of different oils, the method has changed little from century to century and culture to culture. The process is simple, completely natural, and very inexpensive. A proper oil cleanse consists of allowing oil to soak into the skin, which naturally bonds with the dirt and impurities present in your pores. When the oil is removed from the skin, it takes along with it all the detritus and grime that is now trapped in the oil, leaving your skin clean and well-moisturized. A little bit goes a long way. Use less than you think you need to. Overapplication can actually make things worse and cause symptoms to worsen. It may take a few treatments to get consistent results, and results may vary from person to person based on a variety of factors including the severity of condition and length of time the person has suffered from it. Be patient. Finding the right balance of application and treatment may be something of a process. 1. Wash hands with soap and water, then rinse and dry thoroughly. This is important because you don’t want to massage dirt, grime, or bacteria from your hands into your damaged skin. 2. Scoop up about half a teaspoon of your preferred extra-virgin coconut oil. Use less if you think that is too much to treat the affected area. 3. Work the coconut oil into your hands. It should warm and melt at room temperature. 4. Massage the affected area with your coconut oil coated hands. 5. Continue to massage gently and firmly for 2-3 minutes. 6. Allow oil to soak into your face after massaging it in for at least 1 minute. 7. Take a clean washcloth and soak it in warm water. Do not use hot water, as the washcloth only needs to be warm enough to melt the excess oil on your skin. 8. Place warm the washcloth over the affected area and hold it in place for at least 20 seconds. 9. After allowing the excess oils on your skin to warm, gently wipe away the excess with gentle, deliberate strokes. 10. Keep repeating the warm, press, wipe process as many times as needed to remove excess oils. Using this all-natural process has been shown to promote the best results in the shortest period of time, and when combined with a diet supplemented by coconut oil this can be a fantastic way to bring relief and reduce the occurrence of painful flare ups for both chronic skin conditions. Treating eczema or seborrheic dermatitis with topical antibiotics, cortisone cream, and other traditional medical anti-bacterial/anti-fungal measures can actually cause more problems in the long run and often don’t bring relief or even aggravate symptoms further. Give a natural treatment a chance, and allow your body the best weapons possible to combat your symptoms. Ultimately, you are going to make the final call on using coconut oil to treat eczema or seborrheic dermatitis. Your condition is as unique and individual as you are, and like any treatment for a chronic ailment, you will need to do some testing of your own and see if it makes your symptoms worse or better. The most important thing to remember is that if you haven’t tried a natural solution yet, you should definitely give it serious thought before applying antibiotics or steroids that may actually lose their effectiveness over time. As with any new treatment regimen, it is never a bad idea to consult with our family physician or a dermatologist who is open to trying all natural solutions before treating your skin condition with coconut oil. Make sure to monitor your skin’s reaction to treatment, and carefully examine your affected areas for signs of overapplication. I hope you found this article useful in bringing you relief from your eczema or seborrheic dermatitis symptoms. As a person who suffers from occasional flare-ups of eczema on my fingers and hands, I know how painful and uncomfortable it can be, and how much better my skin feels with regular coconut oil application. I wish you many happy, healthy hours, days, weeks, and months of relief with all natural coconut oil. Enjoy what you read and learned today? Leave us a comment below, and share with friends and family who you think might benefit from this information as well.